Hi gang! 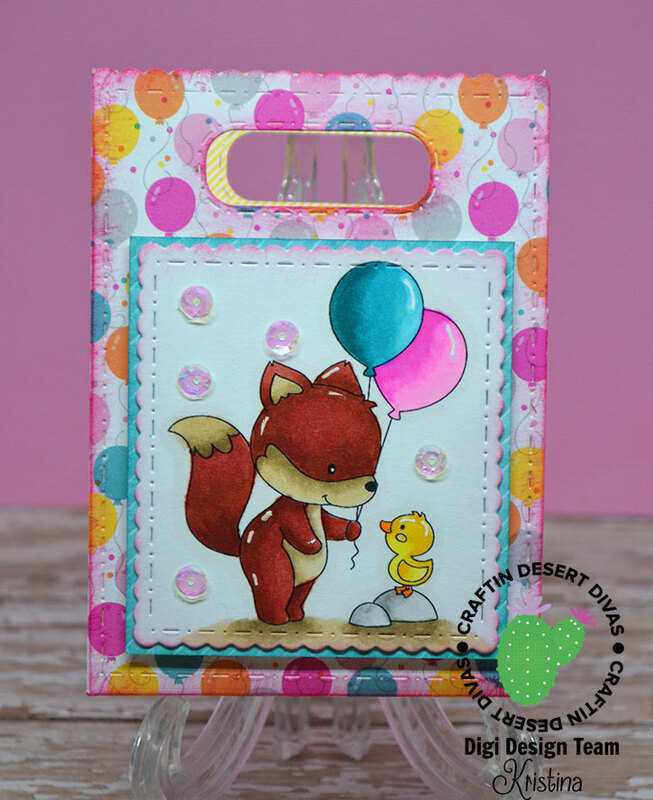 I'm so excited that it is almost time for the new release from Craftin Desert Divas. The sneak peeks are just about killing me!! I love everything I have seen so far. Then again, when don't I? I *might* have a slight problem. Like not enough time to use all my pretty things! I'm sure you all can understand what I mean. You are seriously going to love this new die that is coming out for this release. A TREAT BAG!!! Yes, I know I'm shouting...but YAY! It's oh so cute and you are going to want it. Let me get to sharing my project with you. This die has a lovely mini scalloped edge, stitch detailing and lots of fabulous extras. Tags, handle openings, layering pieces. It's just about perfect I tell ya! I colored up the adorable Just for You digi stamp with copic markers and added a few highlights with a white gel pen. I picked out the colors for the balloons from the sweet Doodlebug paper I used to make the bag. I then cut it out using one of the dies from the Treat Bag set. I inked up the edges with a bright pink ink. I adhered it to the turquoise paper (also from Doodlebug) and popped it up with foam tape. For the treat bag itself I sponged all of the edges with the same bright pink ink to give it some more pizzazz. I also had to add some of the lovely Shimmer sequins. The Treat Bag dies fit perfectly on a 6x6 piece of paper with a little leftover. You will need two pieces of 6x6 to complete the bag. If you're like me, you've got heaps of 6x6 pads laying around (hoarding). Here's a fun and easy way to put those gorgeous papers to use! The Treat Bag dies will be available this week in the New Release section of the store.